I remember that one day, suddenly, in Olshani, there was big news. They stopped shooting. There was a cease fire. Everybody thought the war was over. People began returning to their homes in Olshani, if they had their homes still standing, of course. There was a festive feeling that soon we would return to our home in Vishnive. I recall people dancing in the streets. An old gentile man, called Barazhvich, dancing with a stick and an attached bell. Many people were standing around including my sister Gitke and I. We were tightly attached. Suddendly a "Sheigetz" arrived and twisted my head. I was very scared, I cried a bit, but we continued watching the dancing. What I have to tell is that with time passing, the Vishniveans, my family included, turned out to be a serious nuisance and a threat to the Olshanians. The Olshani Jews began to "Sing" that they do not want the refugees anymore because they made their homes crowded and dirty. They complained to the Jewish Militia (which was link between the Jewish population and the German authorithies). They worried about losing their homes and jobs. Uncle Berl, his wife Rivka, and their families were tired of the "mission" they took upon themselves. 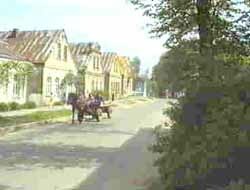 On one sunny day, Chaim the "Politzeman" (Policeman) arrived with a horse and wagon. We tied our "Peklachs" (bundles) with despair and with anger about our uncle's family, and we moved to Karbi, a deserted gentile village, whose residents fled to Russia at the beginning of the war. The village location was 2 km from Olshani. We were moving together with another large family, the family of Meishke der Klimeier. I do not remember other families. We did not feel good in the village. Mother did not want to be there and did not want the insult. The other Vishnivean families did not want to be there either. Everybody began running towards the border between Vishnive and Olshani - towards home. All said they were ready to pay as much as needed for wagons to be taken there. There was a feeling that if we applied pressure, we would be transferred back to Vishnive. After a short time, we re-tied our "Peklachs" and returned to Olshani, where we rented a small room. I remember the "Seder" that Father and the homeowner conducted, the warm atmosphere, inspite of the hard "Matzas" and the small amount of food. I will never forget the hard crust of bread the homeowner used to leave for me on the table, knowing that I am hungry. He used to leave the table pretending not to notice. The cease fire lasted only a short time. As soon as the first cannon began shooting, the war resumed. This was the end of all our dreams of returning home. A few Vishnivean families who could afford bribing the Germans and the Olshanian Jews, stayed in Olshani for the entire war. After Passover (1916), Chaim the "Politzman" arrived with a wagon and an old horse (young horses were sent to the war), helped us load all of our belongings, and the long journey of the Vishnivean refugees to the Grodno District had begun.